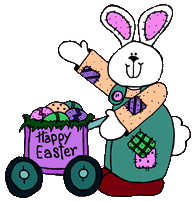 Easter graphics and clipart of flowers, baskets, chicks, Happy Easter and bunnies for your personal, educational and non profit web pages. Happy Easter with basket full of flowers and ribbons. Easter bunny hopping with a basket full of eggs. Happy Easter on field of white Lilies. A very colorful Easter bunny and eggs. 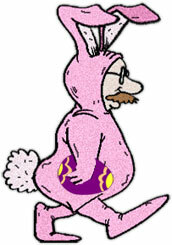 Man in bunny suit carrying a large egg. Easter egg with bunny inside. Animation of the Easter bunny playing with a colored egg. Happy Easter with flowers and animation. Easter chick happy to be here. Happy Easter with glitter animation. Bunny with pride in his egg. Happy Easter with flowers, bunny and glitter animation. Easter basket full of Easter chicks and flowers animation. Two bunnies in their Easter bonnets with flowers. A well dressed bunny sitting on an Easter egg. Are eggs made out of rubber? Cute bunny with flowers and Happy Easter. Easter flower basket with bows and ribbons. Easter Greetings with bunny, birds and animation. Easter bunny with cart full of eggs.